From box CP/CENT/PC/04: FILE 10: Agendas; notes by Bill Wainwright, Bert Ramelson and Peter Kerrigan; organisational documents, January 1959. -- FILE 11: Agendas; notes by Bill Wainwright; organisational and other documents, February 1959. -- FILE 12: Agendas; notes by Bill Wainwright, John Gollan and Syd Abbott; documents on youth, on unemployment, March 1959. -- FILE 13: Agendas; notes by Bill Wainwright; organisational and other documents, April 1959. -- FILE 14: Agendas; notes by Bill Wainwright, Peter Kerrigan and John Gollan; correspondence with Bill Alexander, Syd Abbott, John Mahon; organisational and other documents, May 1959. -- FILE 15: Agendas; notes by Bill Wainwright; organisational and other documents, June 1959. -- FILE 16: Agendas; notes by Bill Wainwright and R. Palme Dutt; organisational and other documents, July 1959. 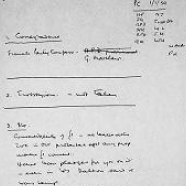 -- From box CP/CENT/PC/05: FILE 01: Agendas; notes by Bill Wainwright and Bill Alexander; organisational and other documents, August 1959. -- FILE 02: Agendas; notes by Bill Alexander; organisational and other documents, September 1959. -- FILE 03: Agendas; notes by Bill Alexander; organisational documents; draft pamphlet on the Labour Party, October 1959. -- FILE 04: Agendas; notes by Bill Alexander; organisational documents; drafts for book "The Challenge of Marxism", November 1959. -- FILE 05: Agendas; notes by Bill Alexander; organisational documents, December 1959. CP/CENT/PC/04/10: Agendas; notes by Bill Wainwright, Bert Ramelson and Peter Kerrigan; organisational documents, January 1959. CP/CENT/PC/04/11: Agendas; notes by Bill Wainwright; organisational and other documents, February 1959. CP/CENT/PC/04/12: Agendas; notes by Bill Wainwright, John Gollan and Syd Abbott; documents on youth, on unemployment, March 1959. CP/CENT/PC/04/13: Agendas; notes by Bill Wainwright; organisational and other documents, April 1959. CP/CENT/PC/04/14: Agendas; notes by Bill Wainwright, Peter Kerrigan and John Gollan; correspondence with Bill Alexander, Syd Abbott, John Mahon; organisational and other documents, May 1959. CP/CENT/PC/04/15: Agendas; notes by Bill Wainwright; organisational and other documents, June 1959. CP/CENT/PC/04/16: Agendas; notes by Bill Wainwright and R. Palme Dutt; organisational and other documents, July 1959. CP/CENT/PC/05/01: Agendas; notes by Bill Wainwright and Bill Alexander; organisational and other documents, August 1959. CP/CENT/PC/05/02: Agendas; notes by Bill Alexander; organisational and other documents, September 1959. CP/CENT/PC/05/03: Agendas; notes by Bill Alexander; organisational documents; draft pamphlet on the Labour Party, October 1959.